The editors over at the Art Jewelry Elements (AJE) blog have once again challenged their readers to dig into our stashes of art beads (buried treasure!!) and make something to start the year off right. Needing to get back in the creative groove, I eagerly signed up to participate and went digging into my art beads! I created some of the designs for Heather Powers' Muffin Tin Challenge (you can see my post on that HERE) and some in hopes of getting published. No matter the push behind their creation, I've managed to make a tiny dent in my art bead stash this month and I'm excited to share my creations with you! First up, a necklace that I made for submission to the Summer issue of Jewelry Stringing magazine for their "Papaya" theme. The pendant is one I bought from Round Rabbit back in January of 2013. The "Flaming Tangerine" color called to me but then it arrived and was a little brighter than my normal comfort zone... and so it sat. The color theme for the magazine inspired me to finally use this bright beauty and, as luck would have it, I had some great beads to pair with it... most of them left overs from other projects. There's some glass from the Halcraft Pretty Palettes challenge I participated in, some tiny coral Swarovski pearls from a necklace re-do project for my friend Angie, plus some faceted carnelian and rose quartz beads that I had picked up on a whim, and some fun seed beads I bought during the Bead Cruise last year. I finally got brave and used the 5mm deerskin leather lace I bought from Nunn Design a while back. I used a technique from one of their tutorials to punch holes in the leather and then stitch the ends together with waxed Irish linen. I'll definitely be trying that again! Next up, two variations on a theme using the adorable starfish beads I got from Michelle McCarthy of Firefly Design Studio. The one on the left was another magazine hopeful that didn't get picked. It has both blue (coated) and yellow quartz as well as some natural sapphire faceted rounds. The one on the right was made for Heather's muffin tin challenge and has a mix of wood, recycled glass, and impression jasper. I love how these turned out and I wish I had snagged a few more of those starfish at Bead Fest! I'm hoping she'll be at Bead & Button this year because I'm determined to at least get there for shopping this year. 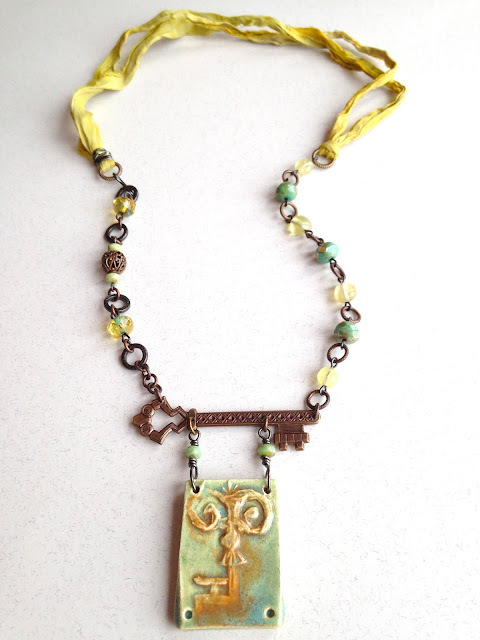 My last piece for today is a necklace featuring a ceramic key pendant from Jenny Davies-Reazor that was in my gift bag on the Bead Cruise. This is another project that I had put in my muffin tin but didn't finish until today. I mixed brass and blackened findings (although it's hard to tell from the picture) for my beaded links. Most of the beads are Czech glass but there's also some prehnite mixed in on the right side. I finished the back with some sari silk in just the right shade of greenish yellow. This is one that I'm definitely going to have to wear test. I need to make sure that the pendant stays balanced hanging from the brass key... I really hope so since I like the effect. I've still got a few more muffin cups filled with art bead goodness that I hope to get to very soon. I mean, I've already pulled together almost everything I need to finish those pieces so I should just do it and get them cleared out of my mental space. Be sure to stop by and check out what everyone else was inspired to unearth from their treasure chests! I love Round Rabbit pendants, I have a huge collection of them, and that particular color is one of my favorite. I love the clever way of stitching the leather. Your totem starfish necklaces are great too, I love the variations with the different metals. Whoa! You deserve a cuppa! So prolific... Thanks for joining us this month Sarajo! The Nunn leather is perfect with the Papaya piece - simple, comfortable to wear and a pop of color. The starfish are lovely and its fun to se the variations on the theme. Ill keep an eye out on Instagram - I saw the key there didn't I? Thanks again! Your papaya necklace is wonderfully fresh and vibrant without being overwhelmingly bright. 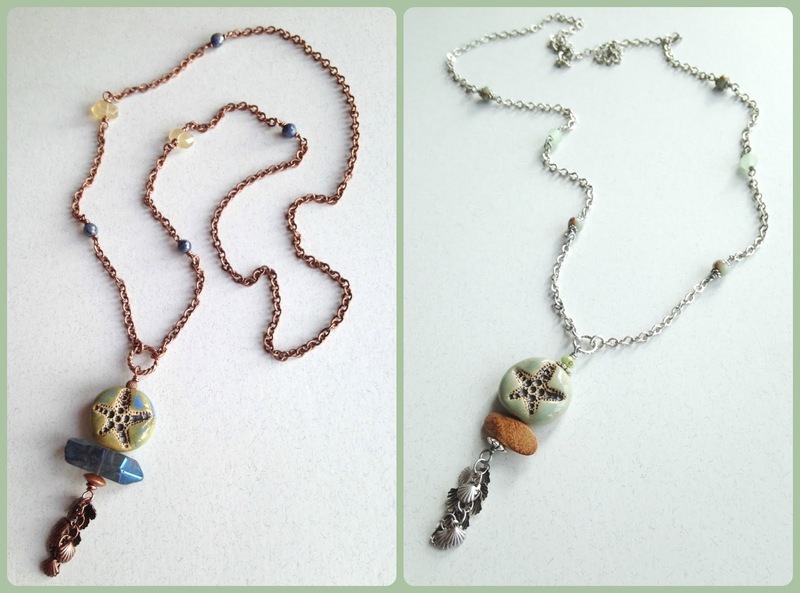 The starfish totem necklaces are fabulous and look like they'd be fun to wear. I love the way you used the brass key with pendant in the last necklace, and the great choice of beads and fiber. What beautiful designs! Love the starfish necklaces, it's a shame that they aren't going to be in a magazine. And that key necklace is incredible. I keep going back to look at it. Wow you made lots of lovely designs but oh my you saved the best till last! I love how you have hung Jenny's key from the metal key and the coordinateing beads beads are just perfect! And you updated the post - you cheeky monkey! I LOVE the Key necklace. Fabulous work! I am especially drawn to the starfish pieces. Really terrific! Lovely pieces -- isn't the muffin tin challenge a great way to do things? Love that your designs are so fresh and spring like and an antidote to the winter gloom...they're all great but I particularly love the key pendant...great layering. 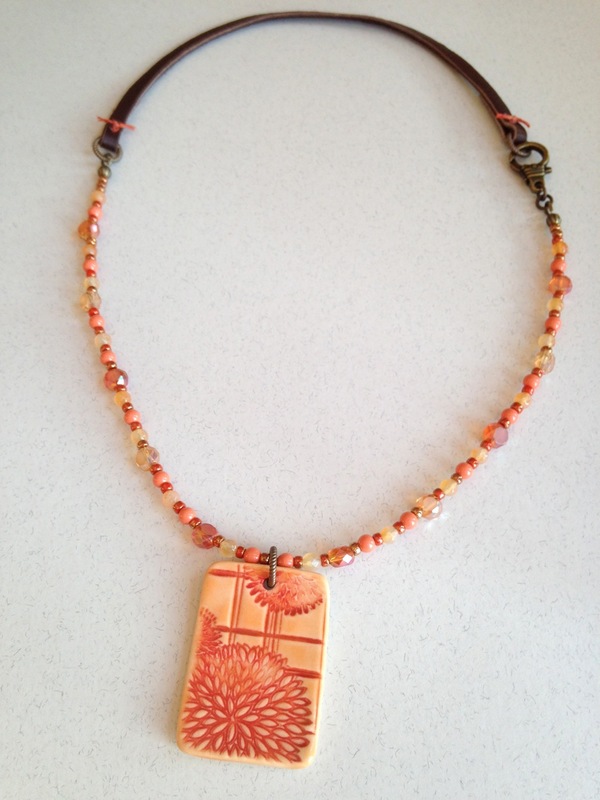 Beautiful art beads and necklace designs! I went through a "peach" phase in the late 70's/early 80's where everything I purchased was some shade of peach. That "flaming tangerine" necklace would have been a perfect daily wear accessory for me! My fingers are crossed for you that the key pendant necklace passes the wear test ... it's a beauty! Introducing the Honey Do List!